and still so much in love with each other .. I feel so blessed to be with my soul mate. FOLIAGE --- protection, refuge and safety. FIBRE/FABRIC -- the tapestry of life . When our son was killed 13 years ago, my world was falling apart . I had to dig deep within myself to find a part of me with the strength to go on and live my life . Mark was always so supportive of my art . and this has played a huge part of my healing journey . a much needed facility helping others heal and move on with life . and in my healing !! I really mean that from my heart . scrap-bookers, means the world to me. you have all helped open my heart again . check out her wonderful blog . What an amazingly beautiful LO. Thank you so much for explaining all the meaning behind it. Thank you for sharing your story with us, Heather. I can see how much of yourself you pour into each page to make it a wonderful tribute to Mark. The butterfly does make a wonder symbol of hope. So grateful to be a part of this wonderful community and meet special people like you. God Bless. sorry for the typo - I meant that the butterfly makes a wonderful symbol of hope. Wow gorgeous layout Heather! Love all teh little details. 45 years congrats that's a long time its a beautiful photo and a stunning page with cool details. A truly amazing layout Heather. And to know all the detailed meaning in it's elements just makes it all the more special. What an incredible couple you must be, beautiful photo! Beautiful page Heather! And it's more beautiful because it's reprents you and your story! I can see not only pretty page but love there, stunning work my friend! Such a beautiful page of you and your husband. And I know from reading your wonderful blog, what beautiful hearts you have as well! Hugs!!! Beautiful, beautiful layout. I can't imagine the pain you've gone through but want you to know that your art is an inspiration to so many. Mark's spirit definitely lives on through your art. What a beautiful touching story!! I loveeeeeeeee that photo, the colors and loving the cluster of goodies on your page!! GORGEOUS!!! beautiful detail. gorgeous layout. there's nothing like friends...especially when u have a great husband like that! P.S. I'm so glad that you're on facebook!!! Your words touched my heart Heather. You have such a beautiful soul and the world is a better place with you in it. I so adore the beautiful, artful details you put on this page. The photo is so warm, loving and beautiful and just perfect for this page. Oh wow, Heather, what can I say, this is one of my all time favourites of your, I love absolutely everything about it, it is beyond beautiful and your words really touched my heart!!! What a beautiful page Heather and the story you have shared here has touched my heart. We have had a recent death of a young family member and it takes great courage and strength to move on from that. You are sharing such great joy with others through your scrapping and creating beautiful works of art to be appreciated for many years to come. Thank you for sharing with us! What a beautiful photo of you and your husband.....and thankyou for sharing the story attached to gorgeous layout! Heather this is just magical. You work the colours so beautifully and then add so many little details. Love the multi coloured chippy and that photo is just gorgeous. Sigh. Such a beautiful page of you and your husband!! Heather this page of yours is really something out of this world...Amaizing work with those colors. Just love your LO, all the details and colours! The picture is soooo sweet and your story so strong.. I so love your art. You are so talented. Your designs are creative and beautiful. 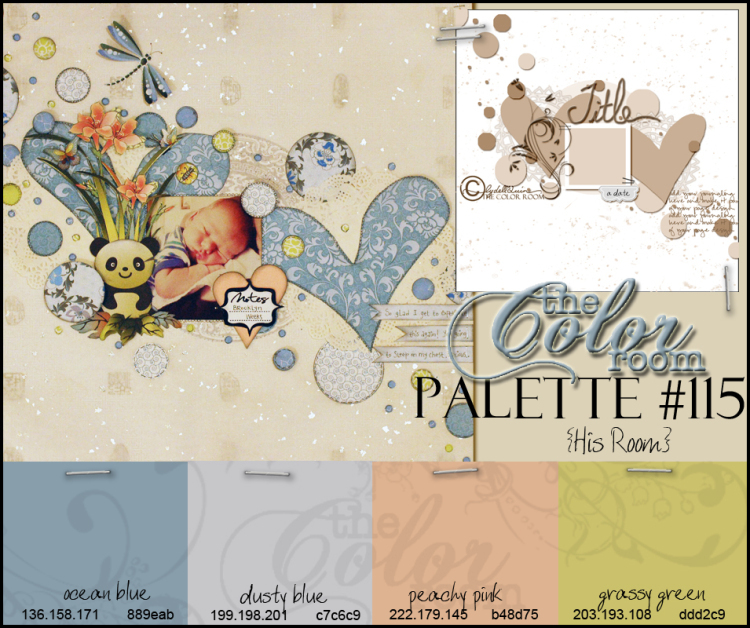 Your color palettes are perfect. But the thing that makes me love your work so much is your heart. You put so much of yourself into your work. There is so much love of life and family. Thank you for sharing so much of yourself. This blog world that we are part of is so amazing. So much support. So much healing. It is about so much more than the art. I love that I have connections with wonderful women like you all around this wonderful world. Thank you! Oh wow Heather this is just drop dead gorgeous!!!! I love the dreamy mix and that pic looks fab! Heather! JUST DIVINE WORK!!!! That layout for TCR is just exquisite! Wow!!!!!!!!!! This is one of my favorites! I just love the arrangement of your embellies and the soft colors!!! Amazingly beautiful layout!!! But..aren't they all?